In 2015 I had the pleasure of working with Phillip Sollmann on his performance/installation Sirene. For the project, I researched how to control two very precise, high-tech Faulhaber motors with Pure Data over a serial connection. Originally designed for aerospace use, the Faulhaber motors became the engines for Sollmann’s air-powered, microtonal sirens which were presented at Oststation, Vienna in the spring of that year. 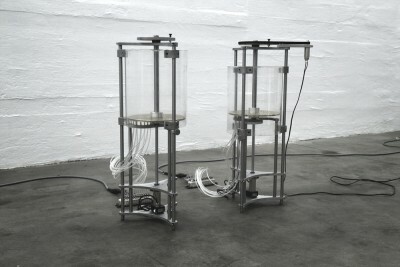 The physical structure of the sirens was designed and executed by Paper/Christoph Blattmacher in Berlin. SIRENE Dokumentation from pa bla on Vimeo. This entry was posted	on Thursday, December 8th, 2016 at 18:42	and is filed under Documentation. You can follow any responses to this entry through the RSS 2.0 feed. Both comments and pings are currently closed. Powered by WordPress v 5.0.2. Page in 1.009 seconds.